The 2019 La Trinidad Strawberry Festival main event—the annual Giant Strawberry Cake, measuring 1.5 x 2.5 x 1.8 meters and weighing about 1.6 tons, ready for 12,000 slices. 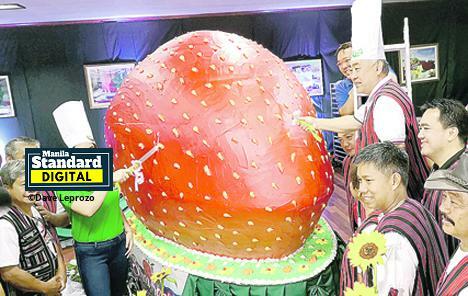 The cake used more than 600 kilos Sweet Charlie strawberries and took three days to bake and assemble. La Trinidad, the capital of Benguet, is a major producer of strawberries, appreciated for its characteristic aroma.